In this essay, Carl Zichella reflects on his New Jersey boyhood and how the commanding words of John Muir and the monumental imagery of the Sierra Nevada changed his perspective and his life. Zichella also examines the ongoing significance of these dual icons—Muir and the Sierra Nevada—on our national and international perception of environmental protection and respect for wilderness. The sun’s heat hit me like a hammer when my companion and I emerged from the cooling shade of Giant Forest in Sequoia National Park and set out on the High Sierra Trail toward Bearpaw Meadow and the lakes and ridges beyond. The hard light of late morning in the Sierra Nevada is so intense it can make you catch your breath when you step into it. The granite slopes framing the trail fairly gleamed like silver as trail gravel crunched under our boots. The intoxicating fragrance of sequoiadendron giaganteum, pinus ponderosa and pinus lambertiana nearly made my head swim. Further along our late September hike, deer came fearlessly down to the trail to check my companion and me out. The season was over and there were literally no other hikers stirring up dust. We had this magnificent range seemingly to ourselves. It was my then-girlfriend’s first backpacking trip and I am afraid I pushed her beyond her limits. Twelve-plus miles with full packs are too many for a first hike … that is if you ever expect the person to go with you again. When eventually we arrived at Bearpaw Meadow, we found we were the only people there, and as camp was set up and dusk arrived, a serene mountain silence surrounded us. The trailside deer helped soothe my companion, as later did the spotted fawns that greeted us when we emerged from our tent the next morning after the excitement brought by the visiting bear whose mid-night efforts to steal our food failed despite a determined, sustained and noisy effort. The cool stream we bathed her feet in and the hot meal I whipped up on my backpacking stove absolved me for her hardships. While she relaxed, I took a stroll and sat meditatively on a fallen tree and surveyed our beautiful meadow listening to the chickarees bomb the forest floor with pine cones in anticipation of the coming winter. “Nice grouse,” said the back country ranger who had quietly approached me, snapping me out of my reverie. Confused I looked at him and replied, “What?” He laughed and pointed next to me. Unaware, I had sat next to a ruffed grouse standing so still I did not even notice it. Together the grouse and I had companionably shared the log for about 15 minutes. When I turned to see what he had pointed at it exploded off the log as grouse will—all flying feathers and drumming sound. I nearly pitched off the log backwards to the ranger’s profound amusement. This was in 1977. It was my first trip to the Sierra and it was a pilgrimage of sorts. A New York City and northern New Jersey kid, I had become infatuated with mountains and wilderness, first the gentle Catskills of my childhood and later the vast “forever wild” Adirondacks of upstate New York. I had struggled after my high school graduation, flirting with college, working as a union carpenter’s apprentice in New York and finally retreating to regroup in the mountains I loved so much and in which I so inexplicably felt at home. New friends introduced me to poets and philosophers who had been inspired and emotionally nourished by far away California mountains in a place called “the Sierra.” I was fascinated by the voices of such writers as of John Muir (as presented in Edwin Way Teale’s The Wilderness World of John Muir) and Gary Snyder’s Riprap and the Cold Mountain Poems—I still have my original copies. These were not on New Jersey High School reading lists of the time, and the world they opened to me expressed perfectly the things I was feeling and exploring in my own life. With my best friend, and later best man at my wedding, Charlie Carver, I went west, like many other confused young guys my age to see if life was different there and if the mountains’ “glad tidings” could soothe my searching heart. The Sierra has always served that role, but it has become more than just a place for people to experience nature’s healing magic at its most beautiful and intense. The Sierra Nevada is also an international conservation icon, symbolic of the protective instinct of people for nature, and emblematic of the idea that one generation has a responsibility not only to succeeding ones, but to preceding ones as well, without whose foresight these wonders may well have been hopelessly degraded. International norms of conservation (such as the establishment of national parks and public preserves) became norms in part because of the famous battles to protect the Range of Light. There was a national park before Yosemite (Yellowstone, established by President Grant On March 1, 1872) for example, but the true meaning of the idea of National Parks took shape around Yosemite, and the utilitarian v. preservation struggles over access and use, including the damming of Hetch Hetchy Valley. Conservation was a relatively new idea in the Muir’s time, the “Progressive Era” (roughly 1877-1930), part and parcel of America’s revulsion at the economic and resource hegemony of the monopolies and trusts of the late 19th and early 20th Centuries. The notion that a public commons was being stolen from the American people gained hold, and the closing of the American frontier and its significance in national identity and the limits of natural resources (as described by Frederick Jackson Turner, a young historian at the University of Wisconsin who, in 1893, presented a paper to the American Historical Association entitled “The Significance of the Frontier in American History”) became recognized for the first time. This awareness took form in many ways: such as public policies like the “forever wild” amendment of the New York State Constitution, added in 1894 to slow the timber barons’ scorched earth logging policies—some two years after the founding of the Sierra Club in 1892, and the establishment of National Parks. And it took firm shape and captured the public imagination in the battles to save the Yosemite and the Sierra Nevada. No mountain range ever had a better press agent than the Sierra Nevada did in John Muir. No press agent even made a more lasting impression than John Muir, whose advocacy in the mass media of the time was unexcelled, and whose eloquence drew to him poets and literary lights like Emerson and Burroughs, and aligned him with presidents and power brokers like Robert Underwood Johnson, editor of Century magazine to make conservation and preservation part of America’s political lexicon. Muir’s national profile and magnetic leadership led to a number of prominent California conservationists electing him as the Sierra Club’s first president in 1892. So great was Muir’s influence that he is still revered and inspires to this day. In 1976 for the national centennial Californians selected Muir as “the Greatest Californian” in a statewide poll conducted by the San Jose Mercury News. What qualified him for this honor? Among other things, it was the public feeling he was responsible for helping save the Sierra Nevada, which by then had become—with California’s coast and redwoods—a symbol of the state’s boundless natural beauty. In 2006, Governor Schwarzenegger selected an image of Muir in Yosemite for the state’s commemorative quarter design. Scores of environmental leaders credit him with their inspiration, including David Brower, first executive director of the Sierra Club. Artists—like Alfred Bierstadt of the Hudson River School of artists—came west to portray the scenes Muir exalted in his books and articles for Century, the Atlantic Monthly and others. Muir’s writings about the abuses being visited on Yosemite began in 1869 when he wrote of the “hoofed locusts”—sheep grazing in the Valley that were visiting havoc on native plants and the habitat of the Valley’s wild species. The year 1890 was a good year for Underwood Johnson-Muir collaboration. Both Sequoia National Park and Yosemite were established as two of the crown jewels of the national park system, a system whose fame influenced nations around the world to protect their own spectacular landscapes. Could Muir have been influenced by the sentiments of organized labor? Perhaps. More likely this idea was common in an America where workers were maltreated and living in squalid and emotionally starving conditions. This was the era of the “Muckraking” journalists, whose exposes of corporate abuses ran co-contemporaneously with Muir’s in the Atlantic, Harper’s, McClure’s, the Century and other magazines and newspapers. Sinclair, Ida Tarbell (author of A History of the Standard Oil Company, an indictment of the brutal tactics of John D. Rockefeller’s energy monopoly), Lincoln Steffens (who wrote The Shame of the Cities in 1904), Jacob Riis (whose photographs of squalid conditions for immigrants and workers in New York shocked the nation’s conscience), Ray Stannard Baker (who in 1908 wrote one of the first books critical of American Racism entitled Following The Color Line) and others were helping forge a paradigm shift in American consciousness. While Muir did not deal in the same economic framework as they did (he never expressed much of an opinion about economic theory), and would never have been considered a muckraker, he did ride the same wave of public outrage and expressed a complementary sentiment that wild places needed government protection before the power of unfettered capital swept them away. This was a message with a ready-made national audience. The Sierra Nevada was Muir’s example of what was at stake. Government protection of wilderness was the antidote to corporate power that would save the Sierra forests, rivers and creatures. It took more than three thousand years to make some of the trees in these Western woods—trees that are still standing in perfect strength and beauty, waving and singing in the mighty forests of the Sierra. Through all the wonderful, eventful centuries God has cared for these trees, saved them from drought, disease, avalanches, and a thousand straining, leveling tempests and floods; but he cannot save them from fools—only Uncle Sam can do that. What separated Muir from the Muckrakers was his connection of the wild to the divine. He was a literary phenomenon. The Muckrakers took a decidedly rationalist view (though their predecessors, the abolitionists were religiously inspired) and with Jane Addams, who coined the term “social work”, Florence Kelley (first child labor inspector in U.S. history) and others developed social sciences as a way to illustrate the need for their reform agenda. They used demographics and labor statistics to make a case for government intervention on behalf of workers. Not Muir. A creator’s hand was obviously at work in the wild Sierra, and his breathless and euphoric prose had the enthusiasm of the itinerant preacher his father Daniel actually was in his childhood Wisconsin. And Muir’s ecstatic prose struck a chord with the American people who, while craving social progress, remained anchored to their religious values. Critics accused him of sentimentality (guilty as charged), but he had perfect pitch for the emotional chords that inspired the people of his time—people of all classes. He was a literary phenomenon. Muir claimed not only minds but hearts. He understood how disconnected from nature people of his time had become, and his insights made him the perfect messenger for wilderness. The Sierra, the purest example of the values he was expressing, had to be preserved; for their own benefit certainly, but always for the benefit of humanity present and future. The Sierra represented goodness; a goodness that could restore people’s hearts and reflected God’s love for all nature’s creatures, including people. It needed no improvement; it needed protection for its perfection. To Muir the Sierra taught that “each time you grab hold of a thing by itself, you find it hitched to everything else in the Universe.” This manifested itself not only in scientific observation—and he was a wonderfully observant naturalist—but also via a sense of divine connection many people of the time, and of this time too, recognized as intrinsic to their lives. In John of the Mountains, the Unpublished Journals of John Muir, he wrote insightfully about the craving he saw urban Americans had for even a hint of nature in their lives. This he saw was the connection needed to create a public constituency for places like the wild Sierra. The window of my city study overlooked the backyard and porch of a hardworking German family. The eldest child, a girl perhaps about sixteen years old, was housekeeper, doing the washing, scrubbing, cooking. Every morning I saw her getting the boys ready for school, blacking shoes, washing faces, brushing and combing the hair of the youngest. But on a little shelf of the back porch she had a row of plants in cans and damaged crockery—geranium, tulip, a small rose bush. This was her garden, which she carefully and lovingly tended though working so hard, stopping in the hurry of housekeeping duties to touch tenderly and look into the faces of the humble plant friends. A fine study—nature in a human heart, in which the scenery surpassed the mountains …. In a tenement’s highest casement. To a little sick child in the basement. … Nature’s plant people, in the hearts of rich and poor alike, that makes parks in towns and fine gardens on estates, and in the one flower-pot gardens in garrets of the poor. The foundation, therefore, of the great National Parks in the mountains is seen to be a safe one. … ahead of his time on the environmental front. So powerful was Muir’s influence, and the passion with which he fought his battles for the Sierra that his passing in 1914 created not a vacuum, but an upwelling of leadership and action. The Sierra Club endured and grew more active in conservation fights. Though Muir lost the battle over Hetch Hetchy with the construction of O’Shaughnessy dam, no dam would ever again be built in a national park, though successors of his in the Sierra Club, led by David Brower, had to creatively and aggressively work to block proposals in Echo Park and the Grand Canyon. No one was more influenced by Muir than David Brower, the Sierra Club’s first Executive Director, and an architect, with the Wilderness Society’s Howard Zahniser, of the 1964 Wilderness Act, signed into law by President Lyndon Johnson. This law and its successors have now preserved more than 107 million acres of the wildest places in the nation. Brower openly professed his devotion to Muir’s values and vision and set about working on “John Muir’s to-do list.” Like Muir, Brower cut his preservationist eye teeth in the Sierra and his love for the range shaped his life and work. He had over 70 first ascents in the Sierra as a mountaineer, and helped train and fight in the famous 10th Mountain Division in World War II. Thrice nominated for the Nobel Peace Prize he was arguably the most influential environmentalist of the 1960s and 1970s. Like Muir, he was an artful user of the media and connected with the environmental values, needs and sensibilities of the American people. This list of environmental leaders influenced and inspired by Muir is literally unending. The author Stephen Fox’s profile of the American environmental movement became entitled John Muir and His Legacy: The American Conservation Movement for good reason. His influence is reflected in the scores of natural features, schools and other public spaces named after him (Muir Glacier in Alaska and the John Muir Wilderness in the Sierra included). There is even a Muir Knoll at the University of Wisconsin, which he attended but did not graduate from. His books remain popular to this day, and photographers like Ansel; Adams and Galen Rowell have used their work to illustrate Muir’s ideas and illuminate his writings. A picture may be worth a thousand words, but their photographs—like Bierstadt’s earlier paintings—conveyed the feelings Muir was trying to express in his prose. He often complained that his drawings were inadequate. How he would have loved to work with Adams and Galen Rowell, whose illustrated version of Muir’s Yosemite is an absolute masterwork of mountain photography. But the Muir we know today might not exist had he never encountered the Sierra Nevada. It exemplified for him all that was right in the world and was worth saving. Its preservation became the gospel he preached, and he the prophet of preservation. In many ways the enormous successes we have enjoyed in public lands protection in the United States issue in part from the fact that he made an icon out of the Sierra. People in other parts of the country sought their own pieces of wilderness to protect. Others, like Sigurd Olson, the Sierra Club’s Edgar and Peggy Wayburn (forces behind saving Redwood National Park and the Alaska Lands Act), and Bob Marshall (founder of the Wilderness Society) took up Muir’s mantle of wilderness defender, using their books to both describe and inspire people to protect places—like Olson’s Boundary Waters on the Minnesota-Canadian border—that were in danger of being mined and logged into shadows of their wild selves. Olson wrote eleven books on the Quetico-Superior region and his efforts led to the protection of the Boundary Waters Canoe Area Wilderness and contributed to the establishment of Voyageurs National Park. Though he scorned Muir’s writing style, and he might object to the characterization, I think it is fair to say that he was a sort of North Woods Muir. They were cut out of the same literary and adventurous cloth. Muir and his love for the Sierra created a template of sorts for the Olsons that have followed. An idea that took shape in the Sierra Nevada has literally covered our small, blue planet. It is not a stretch to say that by transforming the Sierra Nevada from a little known if spectacular place to an icon, he helped create the formula by which future wilderness advocates would build support to protect the North Cascades, Olympic National Park, the Giant Sequoia National Monument (established by President Clinton and putting a check mark next to one of John Muir’s biggest “to-do” items), Kings Canyon National Park and hundreds of others. Across the world, though not always in accordance with Muir’s preservationist absolutism, national parks have been created on every continent. An idea that took shape in the Sierra Nevada has literally covered our small, blue planet. There is goodness in the mountain air and the relaxation of one’s spirit that comes with the hard work of an uphill climb is a gift from the wilderness. The hard light of the Sierra Nevada in mid-afternoon still dazzles and the timberline fragrance still intoxicates. We literally can walk in Muir’s footsteps in the Range of Light. We owe him and those who came before us and fought for these mountains a great deal and that debt will be fulfilled only by handing it on as untrammeled and undamaged as we can to those that follow. 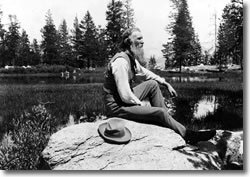 The Sierra brought out the best in Muir’s heart and mind, and in return he transformed his love of this place into a powerful ideal of altruistic conservation held as a common value by millions of our people. He knew we would need the Sierra. He thought of us and acted on our behalf. We can never forget that future generations of people will need it too. The Sierra is an environmental icon. It is a four hundred mile long icon we can feel, smell, see, travel through and share with other creatures. Muir helped shape our perception of what it was, what it meant, and what it symbolized for a nation’s people losing touch with an essential part of its humanity.